The Gaymers sub-reddit and the Electronic Frontier Foundation are seeking to have Chris Vizzini's "gaymer" trademark canceled. The /r/gaymers sub-reddit came under fire last fall from Chris Vizzini, owner of the Gaymer.org website and, as it turned out, holder of a trademark on the term "gaymer." Vizzini claimed that he wasn't trying to make money on the mark but said, "The Gaymer name is something I worked hard on, way before Reddit was even an idea." A cease-and-desist letter was sent but members of the sub-reddit, noting that the term had been in use long before Vizzini's 2007 copyright, have decided to fight it. And they're not messing around. "Many people have pointed out that 'gaymer' was in common use well before it was registered with the Trademark Office; from Yahoo Groups, to USENET forum posts, to academic studies on our little community -- heck, my own Match.com profile is gaymer77. Claiming ownership of the word gaymer is like claiming to own 'soccer mom,' 'baby boomer,' or 'computer geek'," Gaymer sub-reddit mod "Ozuri" wrote in a message posted yesterday. "And so, on behalf of the reddit gaymer community, we have engaged the law firm of Perkins Coie to pursue this matter on our behalf and they are representing us pro bono. Yesterday afternoon we filed a petition with the Trademark Office to cancel the 'Gaymer' trademark registration." The petition claims that the term "gaymer" is "a generic term for members of the LGBT community who have an interested in videogames and the online videogame community," and that "petitioner and numerous third parties have used the term gaymer as a descriptive or generic term since before Registrant used or sought registration for the term." Vizzini, on the other hand, has not "acquired distinctiveness" in his use of the term, it says. "Continued registration of the term gaymer for Registrant's Services is a source of injury to both Petitioner and to numerous third parties who currently use, and are entitled to continue to use, the term gaymer, as it confers upon Registrant the presumptions that gaymer is distinctive for Registrant's Services and that Registrant enjoys the exclusive right to use the term gaymer in association with such services," the petition states. The EFF has also joined the effort and will serve as co-counsel in the matter. "This registration should never have been granted," said EFF Intellectual Property Director Corynne McSherry. "Gaymer is a common term that refers to members of this vibrant gaming community, and we are happy to help them fight back and make sure the term goes back to the public domain where it belongs." 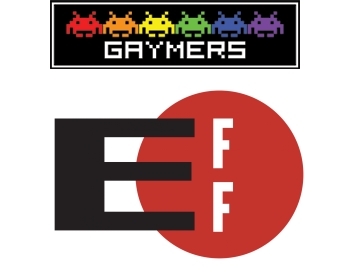 The full petition to cancel the "Gaymer" trademark is available at eff.org.